Dragon year born, Shankari stared exploring Yoga and the spiritual path by the age of 16 and received her Sadhaka Initiation two years later. Since then she got trained as a Yoga teacher and Teacher Trainer throughout the world and in Ashrams in Hatha Yoga, Flow Yoga and Vinyasa, Hormonal Yoga and Laughter Yoga, in over 1000 Hours of educational standard. Since her childhood she had been drawn towards natural medicine, homeopathy and healing. She studied Ayurveda and Tibetean Medicine for four years, got licensed as Thai Massage Therapist by several schools and teachers in Thailand. 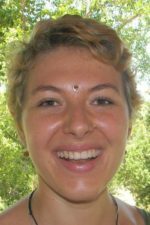 Shankari is also a trained Tao and Tantra Facilitator by the Universal Tao Healing System (Mantak Chia) working with Women’s Heath, sacred Femininity, Qui Gong, Dance and healing Sexuality. In May 2008 Acro Yoga entered her life – which instantly puzzled her long internal wish for celebration of kula-community, empowerment, compassion, connection, playfulness, courage and surrender together. As a graduate Social and Cultural Anthropologist with strong connection to nature, she loves traveling, dancing, sharing, teaching, creating and expressing creativity – following the mission and path of her heart. She shares her passion for acrobatics, partner yoga and bodywork throughout classes, workshops and individual therapeutic sessions, mainly in Europe and Asia, on the beach, in the forest, in ashrams, at the airport, and where ever you catch her.